In a semiconductor, a ‘hole’ is the absence of an electron, and it can move around a as if it were a particle. If you have a hole moving to the right, in reality you have electrons moving to the left. Here pink dots moving counterclockwise look like a green dot moving clockwise! A related puzzle: what happens when you hold a helium balloon on a string while you’re driving in a car with the windows closed… and then you make a sharp right turn? I’ve done it, so I know from experience. • Tom Murphy, a physics professor at U.C. San Diego, has a blog worth visiting: Do the Math. He uses physics and math to make informed guesses about the future of energy production. Try out his overview on ‘peak oil’. • Hundreds of top conservation scientists took a survey, and 99.5% felt that a serious loss of biodiversity is either ‘likely’, ‘very likely’, or ‘virtually certain’. Tropical coral ecosystems were perceived as the most seriously affected. A slim majority think we need to decide on rules for ‘triage’: deciding which species to save and which to give up on. • Climate change is causing a massive change in tree species across Western USA. “Ecosystems are always changing at the landscape level, but normally the rate of change is too slow for humans to notice,” said Steven Running, a co-author of a study on this at the University of Montana. “Now the rate of change is fast enough we can see it.” The study used remote sensing of large areas over a four-year period. • The James Dyson Award calls on design and engineering students to create innovative, practical, elegant solutions to the challenges that face us. 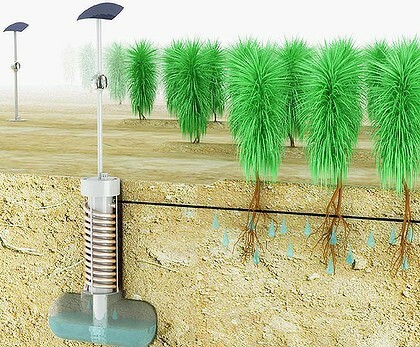 This year, Edward Linacre won for a self-powering device that extracts water from the air for irrigation purposes. Linacre comes from the drought-afflicted continent of Australia. But his invention borrows some tricks from the Namib beetle, which survives some of the driest deserts in Africa by harvesting the moisture that condenses on its back during the early morning. That’s called biomimicry. 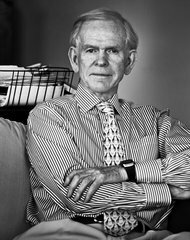 • The New York Times has a great profile of Jeremy Grantham. He heads a successful firm managing $100 billion assets, and now he’s 72. So why is he saying this? … it’s very important to me to make a lot of money now, much more than when I was 40 or 50. Energy “will give us serious and sustained problems” over the next 50 years as we make the transition from hydrocarbons—oil, coal, gas—to solar, wind, nuclear and other sources, but we’ll muddle through to a solution to Peak Oil and related challenges. Peak Everything Else will prove more intractable for humanity. Metals, for instance, “are entropy at work . . . from wonderful metal ores to scattered waste,” and scarcity and higher prices “will slowly increase forever,” but if we scrimp and recycle, we can make do for another century before tight constraint kicks in. Agriculture is more worrisome. Local water shortages will cause “persistent irritation”—wars, famines. Of the three essential macro nutrient fertilizers, nitrogen is relatively plentiful and recoverable, but we’re running out of potassium and phosphorus, finite mined resources that are “necessary for all life.” Canada has large reserves of potash (the source of potassium), which is good news for Americans, but 50 to 75 percent of the known reserves of phosphate (the source of phosphorus) are located in Morocco and the western Sahara. Assuming a 2 percent annual increase in phosphorus consumption, Grantham believes the rest of the world’s reserves won’t last more than 50 years, so he expects “gamesmanship” from the phosphate-rich. And he rates soil erosion as the biggest threat of all. The world’s population could reach 10 billion within half a century—perhaps twice as many human beings as the planet’s overtaxed resources can sustainably support, perhaps six times too many. 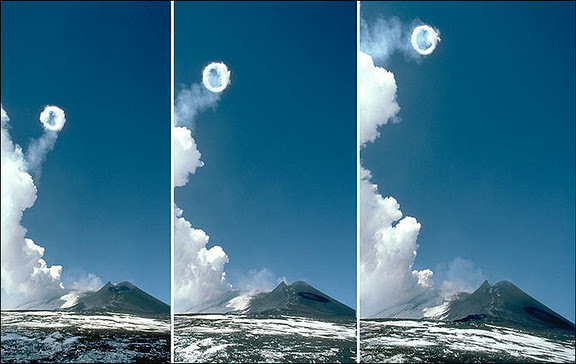 Let’s wrap up with some more fun stuff: impressive volcanos! 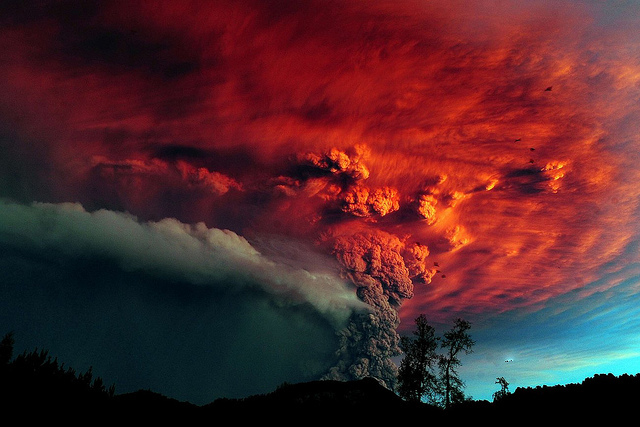 Volcanic lightning photograph by Francisco Negroni. 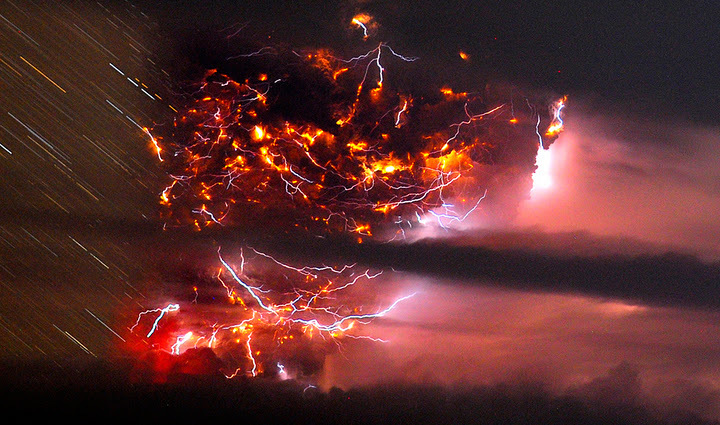 In a scene no human could have witnessed, an apocalyptic agglomeration of lightning bolts illuminates an ash cloud above Chile’s Puyehue volcano in June 2011. The minutes-long exposure shows individual bolts as if they’d all occurred at the same moment and, due to the Earth’s rotation, renders stars (left) as streaks. Lightning to the right of the ash cloud appears to have illuminated nearby clouds.hence the apparent absence of stars on that side of the picture. After an ominous series of earthquakes on the previous day, the volcano erupted that afternoon, convincing authorities to evacuate some 3,500 area residents. Eruptions over the course of the weekend resulted in heavy ashfalls, including in Argentine towns 60 miles (a hundred kilometers) away. 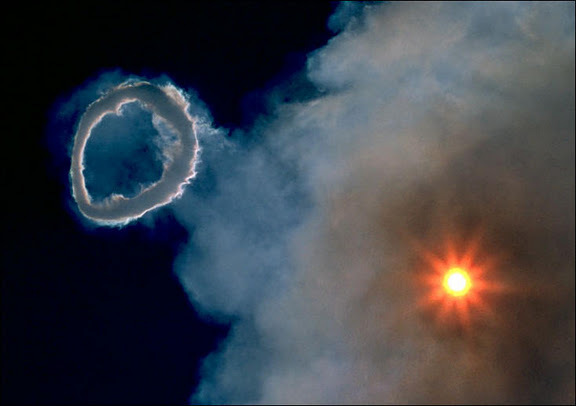 And here’s Mount Etna blowing out a smoke ring in March of 2000. By its shadow, this ring was estimated to be 200 meters in diameter! This entry was posted on Friday, November 11th, 2011 at 2:29 am and is filed under azimuth, biodiversity, climate, risks. You can follow any responses to this entry through the RSS 2.0 feed. You can leave a response, or trackback from your own site. is a good read too. • Peak phosphorus, Azimuth Library. • Phosphorus cycle, Azimuth Library. and I hope people add info to them, or at least give me info here so I can add it. • Planetary Boundaries: Exploring the Safe Operating Space for Humanity. It has an interesting perspective about how the problem with Nitrogen and Phosphorus is not so much a problem of scarcity but rather of unsustainable spilling rate (and so, it’s most straightforward solution would be not so much efficiency as recycling; still both are needed). I still can’t believe we frow so much of them to drinkable water and then to the sea. By the way, ashes fom that chilean volcano still drop over the plants in my balcony. The link does not work. A corrected version is here. It’s a pleasant surprise to see a scholarly article not behind a paywall! I wrote a little script to project phosphorous production into the future based on historic data using a Hubbard peak model. You can get a pretty wide variety of outcomes and the results are sensitive to what you assume the “error” in the data is, since it doesn’t actually follow a pretty Hubbard curve. More of a fun exercise in curve fitting than something useful, I think. Regarding the helium balloon problem, the fun way to think about is in terms of general relativity. Perhaps that’s more straightforward for the ‘plane accelerating down the runway’ version. My fluids prof told us to drive around with a balloon and gather some empirical evidence on this one… A few near-fender-benders later I think I have a rough idea of how this works. The way I think about this problem is that as you press on the brakes (or make a turn, the only important thing is that you are accelerating and hence providing a force) the air tends to pile up in the front of the car, creating a pressure gradient that pushes the less dense balloon to the back of the car. Maybe what David is alluding to is the fact that gravity and acceleration are shown to be equivalent through GR. This means the trivial observation that a balloon floats upwards in our atmosphere, against the force of gravity, implies the less obvious fact that the balloon in our car goes forward when we hit the accelerator. Hey, be careful! You should have one person driving and another manning the balloon! That’s right! But your explanation is right too. If you see a bubble of air floating up through water in a swimming pool, you can reinterpret it as water falling down: the bubble is a ‘hole’, just like missing pink dot in this optical illusion. Similarly, when you hit the accelerator, the air in your car goes crashing to the back of the car, so the ‘hole’, the balloon, moves forward. Incidentally, in Wesley Salmon’s monumental summary of the vast philosophical literature on explanation, Four Decades of Scientific Explanation, the helium balloon example is used to illustrate the compatibility of two kinds of explanation: a bottom-up air molecules producing a pressure gradient approach, and a top-down unification under general relativity approach. Oh, I think the last word of Nick’s comment, and hence John’s quotation, should be ‘accelerator’ or ‘gas’. Yes, you’re right! That’s exactly what I meant. I fixed it, to reduce the chance of spreading misinformation here.